What is MALS / MALLS multiangle light scattering for SEC? 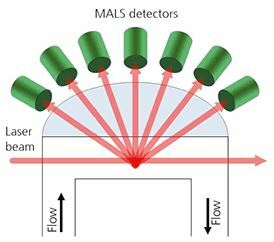 What is multi angle light scattering MALS / MALLS? Light scattering is the effect of light being re-radiated from a sample containing molecules or particles. This scattering depends on the optical configuration of the setup, and in a typical experimental realization, the light is then detected at one or several different angles. In the one-scattering-angle solution, the three most popular designs are 90 degrees (also right angle light scattering or RALS), 7 degrees (also low angle light scattering or LALS), or 173 degrees (also non-invasive back scattering or NIBS). In the multi-angle setup there are in principle those where the angles are fixed (this is most often called the MALS or MALLS* setup) and those where the angles are variable (typically referred to as a light scattering goniometer or spectrometer). When people talk about MALS, they usually mean a system with multiple fixed angles used as part of a size-exclusion chromatography (SEC) setup. 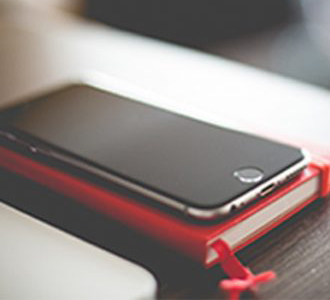 The most widespread application of MALS is as an absolute molecular weight detector in conjunction with a concentration detector (like RI or single-wavelength UV). The number of angles in a MALS system can vary between 2 up to 20 angles, where the scattering is detected simultaneously at each angle. 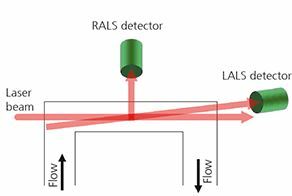 While any light scattering detector (single or multi angle) can measure molecular weight, the main benefit of obtaining light scattering data as a function of scattering angle is that the radius of gyration (Rg) or root mean squared (RMS) radius can be calculated to give the size of molecules. In the SEC scenario, often the scattering molecules are quite small, sometimes so small that the angular dependance is negligible and a radius of gyration thus can not be measured (typical specification limits of these systems are ~10nm). In either case, the molecular weight Mw can be obtained regardless of anisotropy, since it is only related to the scattering at 0° scattering angle. While in principle data from a single angle detector can provide sufficient signal to obtain Mw, assumptions such as “more angles are better” may lead researchers to utilize multi angle detectors with the added benefit of Rg measurements, just in case anisotropy may come into play. 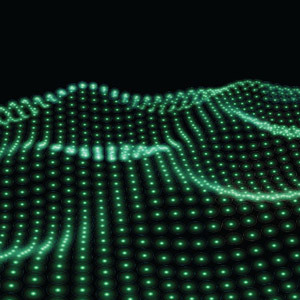 A Malvern White Paper on static light scattering technologies contains a good detailed summary for further reference. *The term MALLS received the additional letter L from laser: multi angle laser light scattering. In recent years, the term MALS has gained in popularity over the previous acronym, and both express the same concept.